Filtration is the process of removing suspended particles from water; both course as well as colloidal, adsorbing undesired odours, colours etc. Simple in appearance, filtration is in reality one of the most sophisticated treatment process. The process is not always correlated to precise laws of physics & not fully explainable. Adsorption refers to the removal of an impurity from a liquid to the surface of a solid. A water-borne, suspended particle adheres to a solid surface when adsorption occurs. Adsorption differs from occlusion in that occluded particles are removed from a process flow because they are too large to pass through a physical restriction in the media. In most cases, adsorbed particles are affected by weak chemical interactions that allow them to adhere to the surface of a solid. Adsorbed particles become attached to the surface of a given media, becoming a weakly held part of the solid. Occluded particles are held in place by the flow of the water as they are trapped against a restrictive surface. The term “depth filtration” generally refers to filtration that occurs by the adsorption of suspended particles onto the surface of the media, throughout the media layer. The entire thickness of the media layer is used, instead of just the media bed surface (surface filtration or occlusion). During surface filtration, only the influent surface of the media bed is actually removing particles. In order to achieve efficient filtration, particles must slow down enough to be held on the surface of a substance. High flows can prevent adsorption due to a lack of surface interaction time. Secondly sufficiently high flow can shear adsorbed particles off the filtering media. Apart from Particle filtration, filtration process is also used for removal of chlorine. Activated carbon is a special form of carbon that is produced by heating organic material (such as coconut shells, walnut shells or coal) in the absence of oxygen. The heat removes trapped moisture and gases and pyrolizes most of the organic material; it also leaves the remaining material with a slightly positive surface charge. An activated carbon bed can remove chlorine, small suspended particles, colloidal particles and dissolved organics due to its ability to adsorb or electrostatically hold particles. These particles would pass between the grains of carbon if not for the weak electrostatic attraction between the positive surface charge of the carbon and the negative surface charge of the particles. Particles can also be trapped in the porous structure of the activated carbon where they are then weakly held. Note that an activated carbon filter is not very efficient at removing most organic compounds from water and is rarely used in this manner. Pressure vessels either made of carbon steel or FRP (smaller flows) with sand or other loose filtration media are widely used in industrial filtration applications. These filters are cleaned using a backwash flow. During a backwash cycle, the filter bed is lifted and fluidized to remove accumulated particles. After the backwash cycle, the filter bed is allowed to settle. While it settles, the filter bed media will classify with the heaviest media particles settling first, and the lightest particles settling on the top. Sometimes air scour is also employed to facilitate backwashing. The air scrubs against the media, loosening the dirt particles attached to it. The backwash waste water is reduced when Air scouring is employed. As depicted in pictures above the filters come in two configurations, vertical and Horizontal. Horizontal filters are used when large flows are to be filtered. Depending upon the application various filter media viz; fine sand, anthracite, garnet or pumice are used. 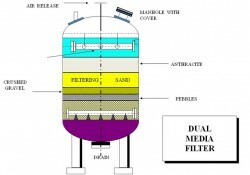 Media filters are used to remove suspended solids and turbidity from the service water. If the turbidity of the service water is greater than 1 NTU, a media filter is needed. The media filter is generally located at or near the upstream of the water treatment system, to protect downstream equipment from the suspended solids. Tertiary treatment for Sewage Treatment Plant.